"Forgive me for wanting a calling bigger than my character." Yes. How often do I struggle with this? Thank you for a great summation of last night's words from Jesus. There's so much for me to process and you've helped me start down a concrete path. Yes and yes! I loved what Jennie and Ann had to say as well. Much of my time last night was spent simmering on how much time I can waste asking the wrong questions- what will it cost? Am I enough? Are we going to be safe? And Ann's comment about character and calling was definitely a prick to my heart. So thankful to have a group of Jesus loving women to process these things with and encourage one another. Souls are at stake and I don't want to waste time focusing on the wrong questions because of my lack of faith. Thank you for these words. This morning on my run I was praying for my day and just asking God, in line with Tim Keller's words that often haunt me, I don't want to think more of myself or less of myself, I just want to think of myself less. I want to be emptied of doubt that "God can't", or pride of "I can", and just take Him at His word. Lord, please heal my unbelief today and let me be used today for lost souls. I was so moved listening and soaking in all these women had to say from my living room last night. Their passion brought me to tears and I longed to be surrounded by Jesus loving women and in that moment God reminded me I am where I am for a reason. He designed me to be me and has CHOSEN us to be exactly where we are for a reason. I feel God stirring and I'm praying for clarity. Jo Saxton's words struck a chord with me, that we can't let our minds hold us captive. There is some excitement and a little/alot unknown swirling in my heart this morning as I continue to process. Looking forward to watching later today all that these women have to share. Thank you for sharing your heart. Good words, everyone! You all give me such hope and challenge me every day. The discussion of faith and character makes me think that by constantly (daily) pursuing a more Jesus-like character, any inhibiting pride or fear WILL melt away giving us a chance to selflessly take action. Just my thoughts on faith at this moment. So grateful for you, Angel, and all you strong women living out your faith! The words that haunted me along with the ones already said were from the description of the 10 scared warriors in the introduction of the scriptures. They kept saying, "Stay Here." We were given statements of, "If God is... Then..." and no matter how I fill in the first part I keep asking myself, "Then am I going to stay here or will I set my foot on the promised land?" I hope that as I continue to ask Jesus to increase my faith that I no longer even have to ask myself that question. He keeps reminding me that it is no longer I who live but Christ who lives in me, I have need of endurance that only he can supply and that unless He does the work, all I do will be in vain. If God is upholding me then that is enough for me. I too am so grateful for you, friend. I look around our community and see so many beautifully gifted and talented women. I find my insecurities telling me that I am not of use in our community because I don't have a talent. I am not very good at anything. I'm a stay at home who struggles to just keep the house and kids from falling apart. I feel like I have nothing to offer. It was so freeing to hear Christine Caine talk about Joshua and that it is service that prepares us for battle, not our gifts and talents. I may not be specifically talented, but I have two hands and a willing heart. He can use that. I'm enough because he's enough. Love you and so so grateful for your leadership and encouragement in my life! The song "Break Every Chain" is echoing in my heart as I continue into the rest of the weekend. I have been so filled with hope and desire to see chains fall in my life as well as the lives of those around me. I'm challenged to believe that God is sufficient, and that He loves me apart from my sin and my duty, and that He desires my freedom as well as the freedom of the world. I'm challenged to walk in that freedom so that others can see, and walk in Christ's freedom too. I've been feeling pretty discouraged and beat up recently. It has felt that with every step closer I try to take toward God, I get knocked back about ten, so honestly IF was not even on my radar. I crawled into bed thinking I would peruse Facebook before going to bed when I came across your blog link....and I am so glad that I did. 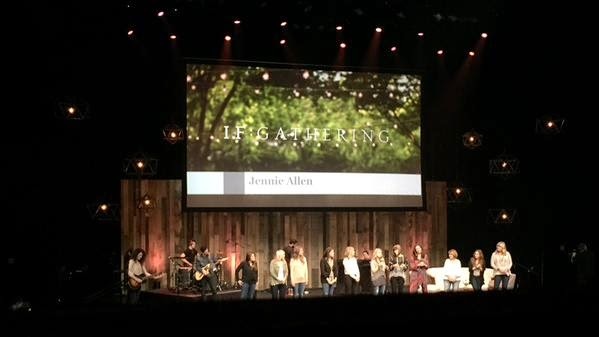 Hearing your heart and catching a glimpse of what is being shared at the IF gathering compelled me to go online and register. I was up the rest of the night wrapped in God's presence watching session 1 and have been spending my "free" moments devouring the words of women who like you sweet friend desire to hear God's heart and pour it out on others. So thankful for God's prompting to join in, so hopeful for what God is doing.